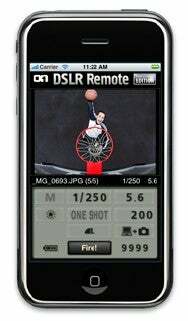 OnOne Software on Monday introduced DSLR Camera Remote for iPhone, an iPhone or iPod touch application that lets you control a Canon EOS digital camera tethered to a Wi-Fi-equipped computer. It’s available in both Lite and Professional versions for $1.99 and $19.99 respectively (the Pro version costs $9.99 as an introductory price). Many Canon EOS Digital Single Lens Reflex (DSLR) cameras can operate remotely on a Mac or PC when they’re “tethered” over a USB connection. OnOne’s new iPhone software lets you operate a Canon camera operating in that mode, freeing up photographers to shoot images when they can’t see through the viewfinder, at events where multiple cameras are set up, or when doing self-portraits. It works with a free Mac or Windows application installed on the host computer, available for free from onOne’s Web site, and supports Apple’s Bonjour zero-configuration networking to find the camera automatically. The Pro version of the software lets users remotely control camera settings including shutter speed, aperture, white-balance and other settings. You can preview images over your iPhone or iPod touch, look through the camera’s viewfinder remotely using Live View (on newer EOS models that support the Live View function), uses a built-in intervalometer for advanced timer shooting, lets you adjust quality settings and can zoom in on post-view images. A list of support cameras is available online. OnOne notes that the 1.0 version works only with select Canon EOS camera models. An updated version is planned that will support Nikon DSLR cameras as well; it will be released as an update to the current app.